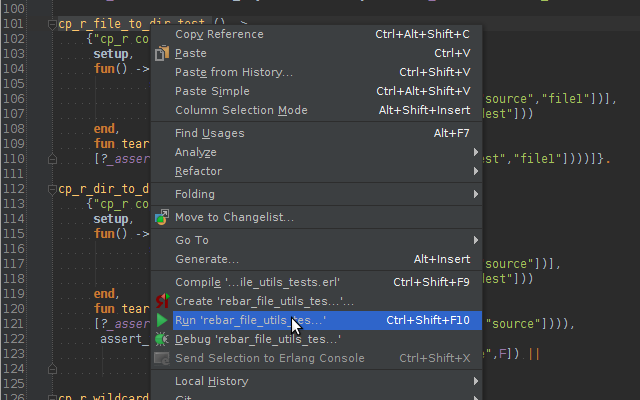 intellij-erlang - the Erlang IDE. 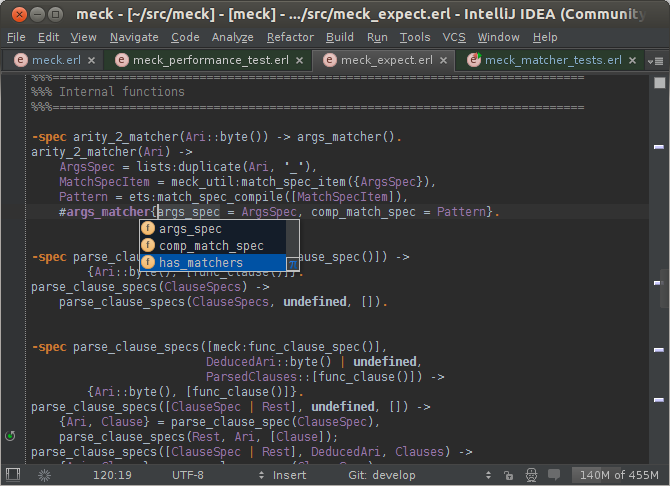 Based on IntelliJ IDEA. Done! 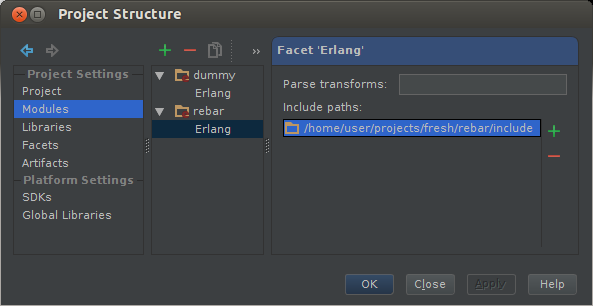 You can import your existing Erlang project or create the new one. If you would like to make a donation you can use PayPal. Very nice guide about IntelliJ user interface. You need to specify a directory that contains bin directory with erl and erlc executables inside. Also that directory should contains releases dir inside. If something goes wrong you always may reopen the #31. 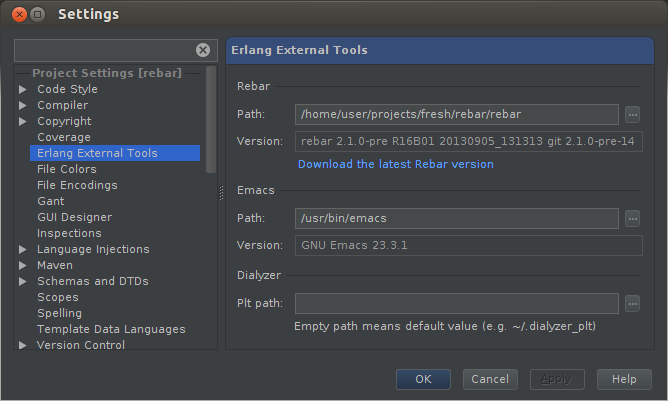 First of all, you need to provide the right path to the Rebar executable (Settings > Erlang External Tools). Note for Mac OS X users. 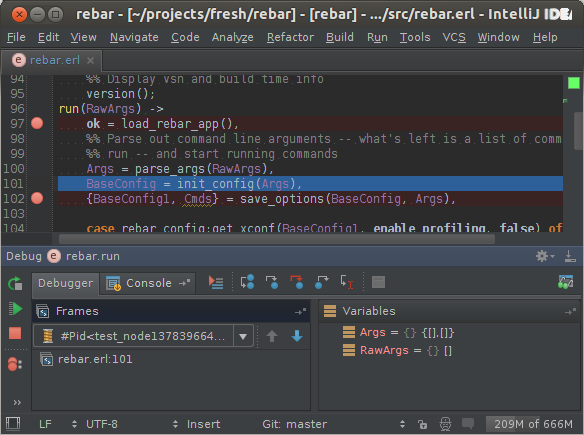 Please, check that the PATH for IntelliJ contains rebar executable. For further information see Stackoverflow answer and #189 issue. Note for Windows users. Please checkout how to install rebar for Windows. 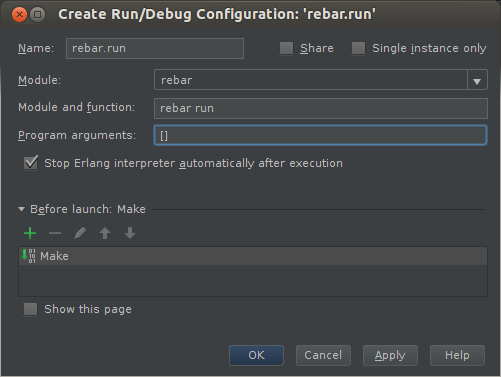 You may create run configuration for every command which Rebar supports, e.g. compile or clean, etc. 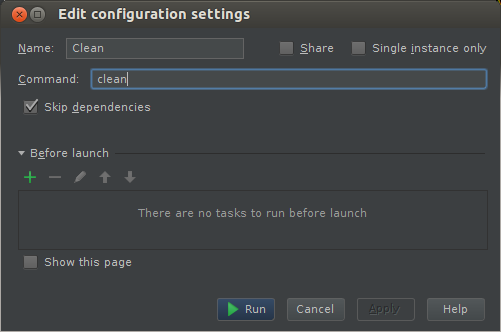 Skip dependencies checkbox adds skip_deps=true command for Rebar executable. 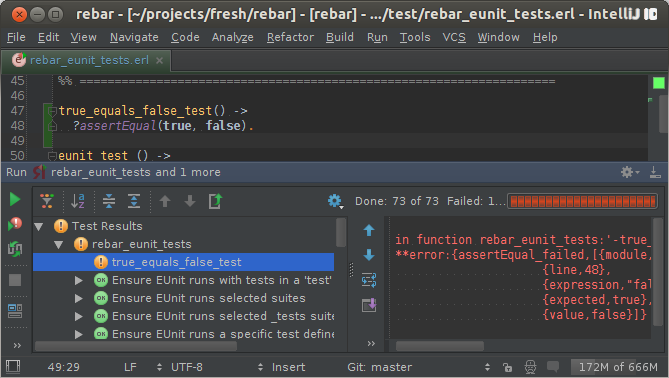 To run eunit tests with rebar you can either create a Rebar Eunit run configuration or use a right-click context menu item 'Run ...' or 'Create ...' having clicked on a module(s), a unit test or a generator function you want to run. In version 0.5 we've added additonal per-module configuration parameters(see Project Structure > Modules). There you can setup your modules' include paths and global parse transformations. 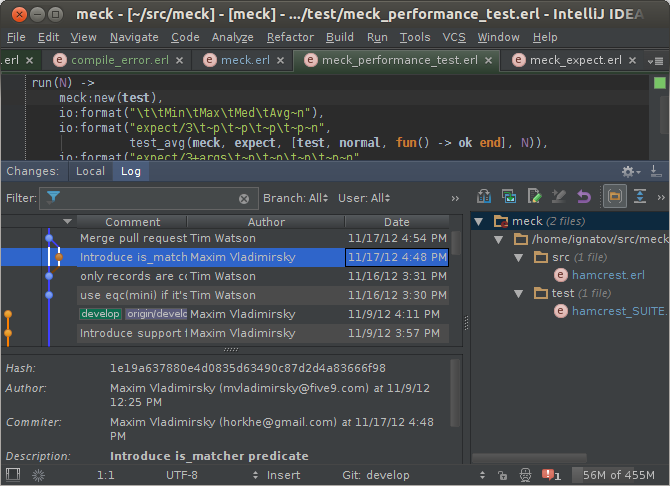 Version 0.5 introduces experimental Erlang debugger support. 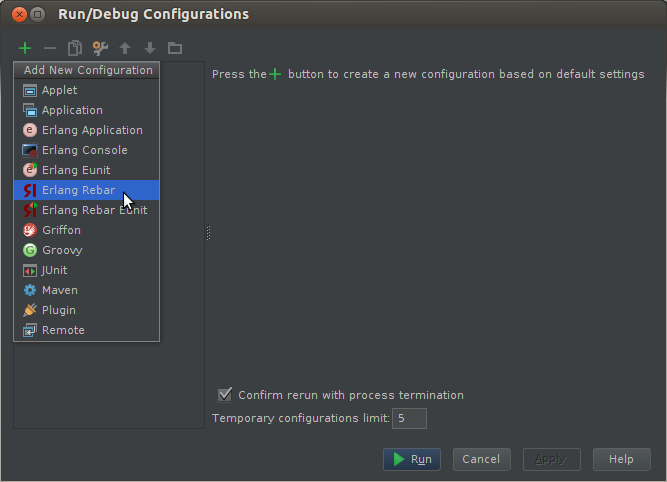 In order to use debugger you need to have debug_info checkbox under Settings > Compiler > Erlang Compiler checked. 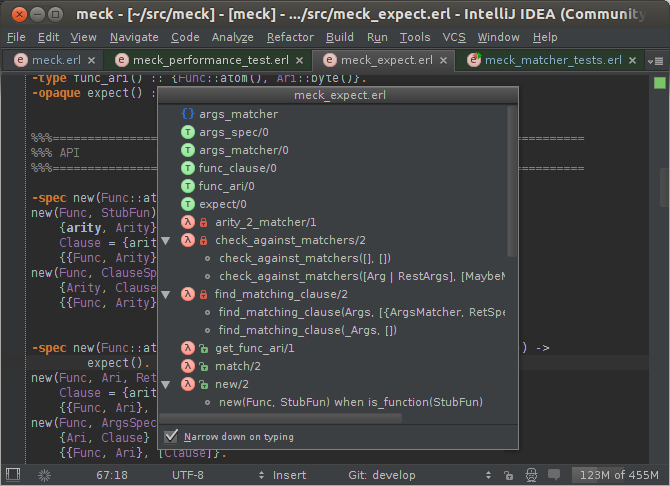 You also need an Erlang Application run configuration which will be used by debugger. Such configuration can be created by right-clicking on entry point function. 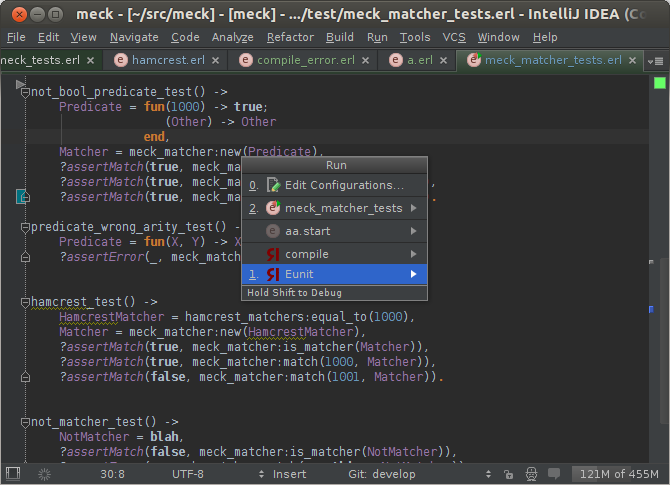 The debugger requires Erlang Port Mapper Daemon (epmd) to be running. If it's not up, a warning will be issued. To start the daemon run any Erlang node on your machine, for example with erl -sname foo -s init stop -noshell command.